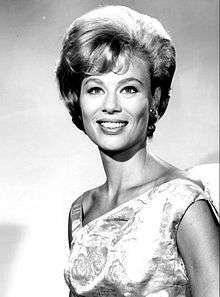 Abby Dalton (born August 15, 1932) is an American actress, known for her television roles on the sitcoms Hennesey (1959–62) and The Joey Bishop Show (1962-65), and as Julia Cumson in the primetime soap opera, Falcon Crest (1981–86). Dalton was born as Marlene Wasden' on August 15, 1932, in Las Vegas, Nevada. Dalton has three children by her marriage to Jack Smith (which ended in divorce), including actress Kathleen Kinmont. Kinmont was married to Lorenzo Lamas, her onscreen son in Falcon Crest. Dalton has made numerous appearances on television. James Garner and Clint Eastwood engaged in a fist fight over Dalton's character in the episode "Duel at Sundown" of ABC/Warner Bros. Western series, Maverick. In 1958, she appeared as Eloise Barton in an episode of the NBC Western series, Jefferson Drum, starring Jeff Richards as a crusading frontier journalist. In January 1959, Dalton was cast as Elizabeth Bingham in the episode "The Desperadoes" of the ABC/WB series, Sugarfoot, starring Will Hutchins in the title role. In the story line, at a mission in South Texas, Tom "Sugarfoot" Brewster learns of a mysterious plot to assassinate Mexican President Benito Juarez. Jack Kruschen and Anthony George guest starred with Dalton in this episode as Sam Bolt and Padre John, respectively. Dalton played a nurse, Martha Hale, on CBS's Hennesey (she was nominated for Emmy Award for her role) with Jackie Cooper in the title role, and she portrayed Joey Bishop's wife on The Joey Bishop Show, a situation comedy on NBC and CBS from 1961 to 1965. As the Hennessey series was ending, The Joey Bishop Show was preparing for its premiere on NBC. Dalton played the role of Ellie Barnes, the wife of Joey Barnes (Bishop). As the show premiered on September 15, 1962, Dalton and Bishop are shown as newlyweds Ellie and Joey Barnes. Hennessey's series finale program was aired two days later, on September 17, 1962, with Martha Hale's marriage to Chick Hennessey. Dalton hence married two different television characters on two different networks within two days. Dalton was a semiregular panelist on NBC and syndicated Match Game and appeared in the early years of Hollywood Squares. Dalton also appeared on Super Password, with Bert Convy as the host, and guest-starred on the NBC interview program, Here's Hollywood. Dalton was cast in the original pilot for what became the ABC series Barney Miller, as Barney's wife. However, that version of the pilot, for a show called The Days and Nights of Captain Barney Miller, was rejected by the network, and the role was recast with Barbara Barrie. In 1977, she appeared in an episode of the ABC crime drama The Feather and Father Gang. In the 1980s, Dalton played winemaker Julia Cumson on CBS's Falcon Crest. In the show, Julia is the daughter of Angela Channing (Jane Wyman) and the mother of Lance Cumson (Lorenzo Lamas). Julia was at quiet odds with her mother, Angela, and for the show's first two seasons, she was troubled but basically decent woman. In the second season finale, however, she was revealed to be a murderess. Much of the third season focused on her dealing with life both in prison and a mental institution, and towards the end of the season, her character escaped from the mental institution to try to kill her mother. Julia was believed to have been killed in the second to last episode, but soon into the fourth season, she was revealed to be still alive. She returned sporadically during the fifth and sixth seasons, but did not reappear after 1986. After leaving the series, Dalton had guest-starring roles on Hotel and Murder, She Wrote. During 1950s, Dalton played small parts in films Teenage Doll, Carnival Rock, and The High Cost of Loving. Her first leading role was in the 1957 film Rock All Night produced by American International Pictures. The following year, she starred in Stakeout on Dope Street, Girls on the Loose, and Cole Younger, Gunfighter. In 1966, Dalton played Calamity Jane in The Plainsman opposite Don Murray, and appeared in the rarely seen film A Whale of a Tale (1976), opposite William Shatner and Marty Allen. Her later films included the Don "The Dragon" Wilson movie CyberTracker (1994), Buck and the Magic Bracelet (1999), and the horror film Prank (2008). ↑ "Abby Dalton - Biography - Movies & TV". NYTimes.com. 1935-08-15. Retrieved 2013-10-13. ↑ "Uneasy Riders". Retrieved 25 April 2015. ↑ ""The Desperadoe", January 6, 1959". tv.com. Retrieved December 23, 2013. ↑ "Abby Dalton | Academy of Television Arts & Sciences". Emmys.com. Retrieved 2013-10-13. ↑ "Abby Dalton Biography (1935-)". Filmreference.com. 1935-08-15. Retrieved 2013-10-13. ↑ Hal Erickson. "The Plainsman (1966) - David Lowell Rich - Synopsis, Characteristics, Moods, Themes and Related - AllMovie". AllMovie. Retrieved 25 April 2015.